ESPN.com writer and Dodger Thoughts bonne amie Molly Knight showed Yankee pitcher Joba Chamberlain who's boss. More from Knight's Super Sunday at her blog. You don't have to go home, and you can stay here. For those who haven't heard, Andrew Lambo has moved to the top of the Baseball America Dodger prospect list. In 2008, the 6-foot-3, 190-pound 20-year-old outfielder from Newbury Park followed an .807 OPS for Class A Great Lakes by going 14 for 26 with three homers for Jacksonville. Here are the Dodger farmhands with the best tools, according to BA. Spurred on by a joke by Dodger Thoughts commenter Jim Hitchcock, fellow commenter Humma Kavula had a nifty idea today. Major Leaguers hit long fly balls and then run the bases. He must keep running until he crosses home plate. Kids field and try to tag him out. Major Leaguer gets five outs. ...yes, yes, I would watch that. I would too. Let's get the lawyers to draw up the release forms and test it out at Dodger Stadium. The only change I would make is to eliminate the need for a tag out. Just make the kids throw it into a general area before the batter/runner crosses home plate for the out. I don't want to see Pete Rose III obliterate a little kid who's trying to tag him. While it's not true that Andre Ethier's arbitration case will be settled in the Showcase Showdown, the Dodgers' winter caravan will take the team to a taping of The Price Is Right on Wednesday. A full schedule of the week of community events can be found here. The Dodgers' starting catcher will have "J. Martin" on the back of his jersey this season, writes Ken Gurnick of MLB.com. Russell Nathan Jeanson Coltrane Martin is doing so to honor his mother, whose maiden name is Jeanson. Gurnick's feature on Martin also brings us one of the Dodgers' initial "fresh start" pieces of 2009. Martin believes this also is the time he puts his game back on track. Those who had seen his first two seasons in the Major Leagues, and even those watching him for the first time, sensed something wasn't quite right in 2008. Although still an All-Star and postseason starter, Martin wasn't the same player or person as the National League's Gold Glove and Silver Slugger catcher the previous year. Speculation ran the gamut from a hidden injury to a swollen ego. Whenever asked, Martin said nothing really had changed. "I understand completely why people thought that," Martin said this week. "A lot had changed in my life. I think it's just part of growing up and maturing. I'm finally just taking responsibility and taking control of everything. Dave Cameron writes at Fangraphs about not giving up on propsects who hit a rough patch: "Don't judge a player with a long history of success on one bad season. Talent shines through, even if not immediately." Keith Thursby of the Daily Mirror points out that the 1949 Los Angeles Angels might have been more of a major-league team than the 1949 Chicago Cubs. While I was filled with self-involvement in promoting my book, seemingly every other Dodger blog wrote about the offhand revelation by Dodger pitching coach Rick Honeycutt (to Ken Gurnick of MLB.com) that James McDonald would start the 2009 season in the bullpen. My first reaction is that I don't think decisions like this are finalized in January, but I don't have a problem in principle with continuing to break McDonald into the majors as a reliever, as long as the Dodgers retain an open mind about him as a starter. There's certainly no reason to worry about the Dodger bullpen depth. The Dodgers already have a mix of great young arms and moxieful veterans. While you always look for ways to improve your team, there's very little the Dodgers can do now that's meaningful. I'll talk some about the Dodger starting rotation soon. There are nine Webkinz days on the 2009 Dodger Stadium promotions schedule. I'm pleased to announce that my book, 100 Things Dodgers Fans Should Know & Do Before They Die, is on its way to the printers and is on schedule for publication in April. I really think you're going to like it. Throughout last year, I applied the Dodger Thoughts approach of research and reflection (and joy!) to every aspect of Dodger history and the Dodger experience. The result was something that I think will be a lifelong companion to what you've seen here online. The goal was to make the book meaningful to old and new fans alike, and I was constantly finding new insights into Dodger people and events you'd think you knew inside and out. Former Dodger owner Peter O'Malley was kind enough to write the foreword for the book, and also gave permission for me to use numerous old photographs, many of which have not been published in decades, if ever. Some of them just made me shake my head with delight. The readers of this site were never far from my mind when I wrote the book. You are among the most dedicated Dodger fans in the world, and I aimed to satisfy. I'm hoping you'll think I did. 1) If you would like to attend a Los Angeles book release gathering in late April, don't order the book yet. You can buy the book directly there. 2) If you can't make the gathering and would like to pre-order the book online, do so directly from the Dodger Thoughts link on the left. 3) Eventually, the book will be in bookstores and you can buy it in person, though I don't know right now that you'll find it many places outside of Southern California and New York. You won't want to miss such chapters as "The Sweetheart From '88" or "The Head-Spinning, Allegiance-Shifting, Authority-Defying Leo Durocher." 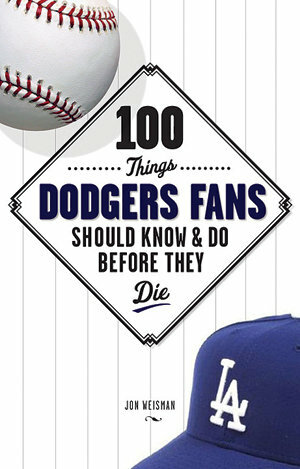 Get excited for your copy (and your friends' and family's copies) of 100 Things Dodgers Fans Should Know & Do Before They Die. John Updike, the author of Rabbit, Run, which I have long considered my favorite novel, died today. Updike, who also wrote the famous farewell to Ted Williams, "Hub Fans Bid Kid Adieu," was a significant influence on my writing and the way I express my feelings toward life. "On purely literary grounds, he was attacked by Norman Mailer as the kind of author appreciated by readers who knew nothing about writing," The Associated Press noted today. Maybe so, but I'll still take him. Here's the conclusion from his short story, "The Happiest I've Been." "There were many reasons for my feeling so happy. We were on our way. I had seen a dawn. This far, Neil could appreciate, I had brought us safely. Ahead, a girl waited who, if I asked, would marry me, but first there was a vast trip: many hours and towns interceded between me and that encounter. There was the quality of the ten a.m. sunlight as it existed in the air ahead of the windshield, filtered by the thin overcast, blessing irresponsibility - you felt you could slice forever through such a cool pure element - and springing, by implying how high these hills had become, a widespreading pride: Pennsylvania, your state - as if you had made your life. And there was knowing that twice since midnight a person had trusted me enough to fall asleep beside me." 1) New Dodger backup Brad Ausmus has been trending sharply downward in effectiveness, though the low rate of stealing attempts against him implies that opponents haven't realized it. 2) Henry Blanco, signed for cheaper dollars by the Padres on the same day the Dodgers agreed to terms with Ausmus, has the best caught-stealing percentage for a catcher over the past six years. "At age 36, Blanco has shown no signs of slowing down, having a normal CS% over .500 in 3 of the past 4 seasons," Cartwright said. 3) Dodger starting catcher Russell Martin fared above-average in the study, with a normalized caught-stealing percentage of .325 that ranked sixth in the majors last season. In the comments on the study, Dodger Thoughts reader Xeifrank questions its viability. Matt Kemp makes sabermetric news again. Rich Lederer of Baseball Analysts looked today at the effect of a hitter's groundball rate on his BABIP (batting average on balls in play), and he noticed that Kemp had the lowest groundball out rate in baseball in 2007 and nearly repeated the feat last season. Kent was a very good player for a long time, and an often misunderstood one. His lack of charisma and his businesslike approach made him an easy target, though his humorlessness should never have been confused with a lack of passion for the game. From this vantage point, he looks to be a borderline Hall of Famer at best. Even with no particular love lost for him as a fanone who spent years rooting against him as a Giant before settling down and appreciating his uneven virtues with the DodgersI'll admit that this still contradicts my gut instinct, but then that's one of the reasons for the five-year waiting period before a player reaches the ballot. Nonetheless, I strongly suspect he'll find his way into Cooperstown in due time, and if that's the case, it will hardly be the crime of the century. The team and press blogs, Josh Rawitch's Inside the Dodgers, Tony Jackson's Inside the Dodgers and Diamond Leung's Press-Enterprise blog, along with the Times baseball writers on The Fabulous Forum, have emerged as indispensable sources for information and insight. Blue Notes became the go-to site for player interviews and really developed a smart, gracious style and outlook. Eric Stephen's surge onto True Blue L.A. has been exciting, and helped it keep pace with the analysis and sharpness provided by Mike Scioscia's Tragic Illness and Fire Ned Colletti Now. The Sons of Steve Garvey have grown up fast. Baseball Savvy boasts a well-defined point of view and longstanding credentials as the champion for a Sandy Koufax statue at Dodger Stadium. Dodger Sims regularly updates the cold, hard projections about the 2009 Dodgers. The Trolley Dodger and Blue Heaven are particularly fun on the historical side. And this isn't even everyone. I like to think Dodger Thoughts is a big deal, but it sure isn't the only game in town. Reading all these other sites is a real kick in the pants, and while I might take it easy in these final few days of January, I know I'm going to have to be at the top of my game to keep pace with these other great sites. What a remarkable time to be a Dodger fan.